Let’s face it: a home theater or any TV system is incomplete without an up to the mark sound system to match its quality. As the displays are getting slimmer, the feeble speakers that come with it need a technology to boost up their audio. Fortunately, you can already find the best soundbar for projectors or TVs for those needs. Many brands offer great features and value for your money. The choice is really overwhelming and choosing the perfect one is tough. Don’t fret as we are here to help! We will review three products of three leading brands. We have chosen three of the best-selling soundbars today and evaluated their features, as well as identified each of their benefits and drawbacks. This Bluetooth speaker from BYL will make you run for your money. The reason it runs top of its game is that it offers a smart design, easy usage, and exceptional features. 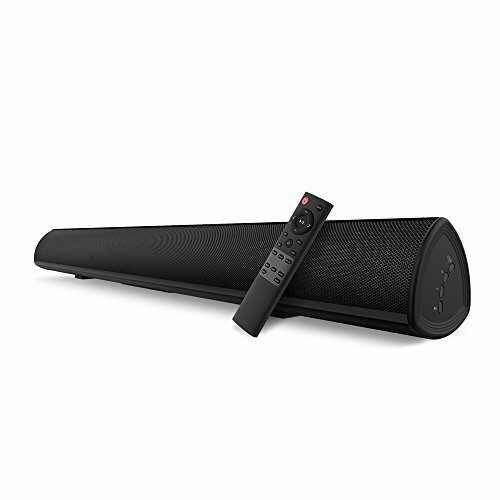 This soundbar comes in a sleek, black design and has a very accessible remote control system. It can be operated by your own TV or cable remote easily, without the hassle of having multiple remote controls. It also has a memory function enabling the remote’s reset button to remember the factory settings. The DSP technology incorporated allows you to decide what you want to hear according to the genre you are watching. Hence, when you choose the dialogue mode, you can listen to them more clearly and ignore the background sounds which hinder their clarity. Similarly, you can enjoy the music to the fullest without any disturbance. It also features a movie mode that offers the more prominent background sound creating a perfect movie-night experience. Besides that, its state-of-the-art Bluetooth wireless system gives you anti-interference, lossless audio. Also, the powerful dual speakers are designed with a unique loudspeaker cavity structure to deliver premium acoustic sound and clear bass. The 20W full frequency and three-inch drivers also help produce multi clean, multi-dimensional music. In terms of accessibility, the optical input allows multiple connections. That means you can amplify the sound on your projector, TV, phone, PC, or tablet with one soundbar. This helps you avoid extra cable clutter. Furthermore, built-in bass reflex ports give individual attention to the bass. This soundbar produces incredible bass in 2.0 channel field. With the customized remote, you can easily turn the bass up or down to your liking. 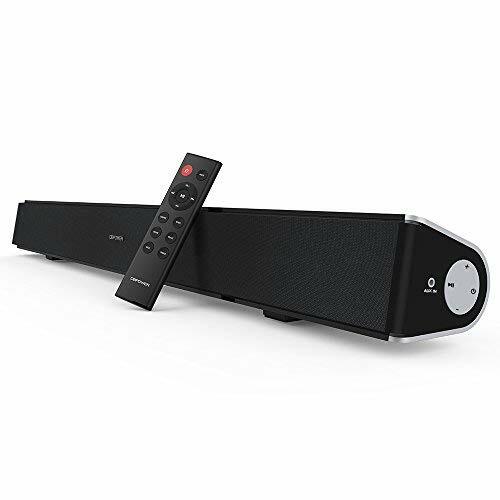 If you are a homebody, this TaoTronics soundbar will surely bring the theater to your home. It has a compatible, powerful, and accessible design that makes it a great choice to amplify your sound experience. The package comes with the 16-inch speaker, a power cord, and a user guide. It produces powerful audio and is compatible with a vast array of devices such as PCs, laptops, smartphones, tablets, and projectors. In short, anything that has a 3.5 mm headphone jack. This compact and lightweight sound system has an uncomplicated setup and can be mounted on the wall, while usage is made easy by color-coded cables in pink and blue for the mic and headphones. It is equipped with a knob that serves as a volume regulator. The microphone and headphone output make it ideal for late-night movie and gaming sessions. For the best music experience, and to avoid any nuisance or headaches, it provides audio track shuffle with bass control, bass softener and treble control. Lastly, the Bluetooth connection on this product is flawless and powerful. Its multiple technology systems keep the Bluetooth well-connected and stable. The smart soundbar from DBPOWER is a great choice to elevate your TV sound and bring a cinematic atmosphere to your home. While avoiding any static noise or distortion, it delivers rich and realistic sounds that feel natural to your ears. This high-quality speaker sports 40W built-in speakers to amplify sounds from multiple devices such as projectors, TVs, PCs, and tablets. As such, it is ideal for a better sound experience while watching movies, listening to music, and gaming. The unit can be controlled physically through buttons and remotely via remote control. Almost all settings can be remotely controlled, so it keeps you hassle-free and does not disturb your entertainment. You can perform volume adjustments, sound mode selections, pair with devices, and choose signal sources all while lying on your couch. It wirelessly streams music through a 4.2 Bluetooth from your devices, the connection ranging up to 33 feet. It is specially made to amplify sounds and is more effective in moderately sized rooms rather than its counterparts. As mentioned before, it is connectable to multiple devices via line in, optical, or aux connectors. It is a breeze to install. According to your space availability, it can be placed on your TV stand or mounted on your wall. Also, its anti-slip base reduces its risk of getting knocked off. This speaker provides you three sound effects, increasing its utility. You can customize the audio according to what you are listening to at the moment. You can also choose between a clear dialogue for sports and news, or 3D surround effects for movies. Also, it allows recreating live, concert-like sounds in your living room. After reviewing the multiple specifics of three models of soundbars, we concluded that the BYL Soundbar is the most beneficial package. While all three have almost similar features of sound effect selection, device compatibility, space-saving design, and wireless connections, the BYL Soundbar has a few specifics that put it ahead of the other two. Firstly, you can operate it with any remote control. Secondly, it has a great level of bass settings, making it a better choice. This sums up our review for the best sound bar for projectors and other devices. We hope it helped you choose the soundbar that best suits your needs and preferences.